So by now you know the first thing to do once you hit 70 is work on getting some epic gear, and you now know about setting up an arena team and plugging away ASAP for some of the best gear out there. But there's a much faster way to get gear that (while not the best) is very solid. Welcome to the Battlegrounds! Let me give you a very brief history..... Originally the Burning Crusade expansion introduced The Area (known as season 1). Season 1 ended on June 19th 2007, and new gear was released for Season 2. The old season 1 gear became available at a 15% discount. All the Season 1 gear became available via a combination of Honor points and Marks of Honor. This is great news for everyone, especially Retribution Paladins because the Ret spec really shines in the Battlegrounds. If you play it right you can easily get an armor or weapon item for a weeks worth of play. Maybe even 2 per week if you're lucky or play all day. 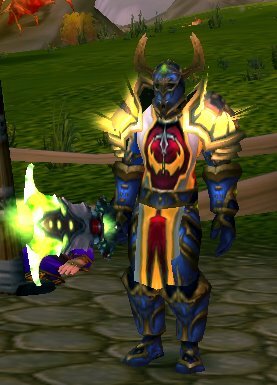 As a Ret Pally you're going to want to purchase the Gladiator's Vindication Set. It has all the major slots except Back and Fingers. Items cost between 10,000 and 17,000 honor points. There is also two excellent 2h weapons, Gladiator's Greatsword or Gladiator's Bonegrinder. Available for 27,000 points and 40 AV marks of honor. At this point you're probably thinking WHOA DRUNKENCLOD That's a lot! Or if you haven't ever hit the battlegrounds before you may be thinking OK how long is this going to take? I won't lie to you, this is going to be a lot of PVP. The great news is that as a retribution Paladin PvP is where you will shine! Many of you may have been holy or protection pally's and are switching to ret because you're tired of spam healing or not dealing enough damage. You're going to love respeccing to a retribution build for PvP. Many of you had an idea that when rolling a pally you envisioned the holy warrior standing tall amongst hordes of enemies smiting them left and right whiles occasionally tossing of heal and cures to his friends. Holy spec pally's are just getting tired of being healbots. As a ret Pally you WILL be on the front lines, standing tall amongst the hordes of enemies. With your Gladiator's Greatsword you cleave thru the horde and many times will jump right into a pack of horde, grabbing their attention with consecration spams, two separate stuns and damage in excess of 2,000 per hit. Then bubble yourself for an extra 6 seconds of life allowing a teamate to reheal, or heal yourself if necessary. You'll be the one rushing the flag in the AV, and there defending the bases in AB and it's you in the middle of EOTS blocking the horde's access to the narrow pathway to the flag so your teamates can run to safety with it. If this sounds more exiting then spamming heals all day and having folks yell at you for not keeping them alive... it is! Remember to follow the links in the article for more info... tomorrow I'll go into the specific battlegrounds, which give the most honor, which ones win the most (or least) and most importantly how to get as much honor as possible in the least amount of time! Great posts again, very informative. When doing the battlegrounds does it work the same way with regard to teams? I.e. 2v2, 3v3, 5v5 etc? Or can you go in solo and do 1v1 battles too? Another question, when picking someone to team with, do they need to be the same level as you? For example, could my level 55 pally team with a 62 warrior? Thanks for the posts, when you finish blogging about gear it might be intersting to see what you have to say about the tactics you use in pvp, i.e. what spells you use etc. I suppose it will depend heavily on which classes you are fighting against though. Also, which add-ins do you use? Hey Lachlan... you got it, I'll be addressing tactics a bit later. In the mean time, regarding your arena question you MUST be level 70 to participate in a rated arena match. Skirmish matches are available to anyone below level 70 and you can parter with a differnt (lower) level person.... but as you don't get any points for skirmish matches it's only good to get a "feel" for fighting but you won't get any armor. Also, for skirmish matches you don't need a charter. Anyone at any time can do skirmish. Level 70 arena will not let you go in by yourself and there is no 1v1 bracket. If you join a skirmish match by yourself WOW will automatically try to pair you up with a random partner (similar to the battlegrounds). So you can try a skirmish by yourself, just expect a random parter to join you.... Sometimes you wind up not getting a parter for whatever reason, in those cases you would be fighting by yourself. Again that only applies to skirmish, not rated arena.